2013年10月23—25日，健康老龄化：中、德、日的多学科研究国际研讨会. Institute of Population and Labor Economics (IPLE), Chinese Academy of Social Sciences (CASS). 全国老龄办副主任肖才伟参加健康老龄化国际研讨会. China National Committee on Ageing (CNCA). “中益的云”实现老人的梦. Zhongyi Ageing Development Center, Ministry of Civil Affairs of PR China. How do well-being, satisfaction, and happiness change over the life course in China, Japan, and Germany? 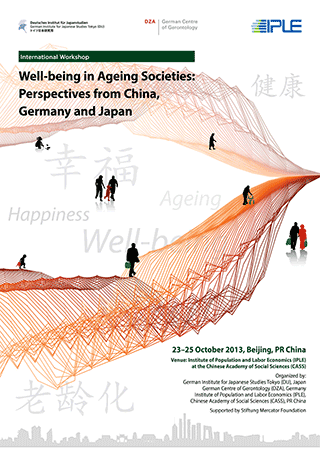 What are the individual, economic, and societal factors that affect well-being, satisfaction, and happiness of older adults in China, Japan, and Germany? Which societal institutions, cultural frameworks and social policies help to enhance the well-being, satisfaction, and happiness under conditions of population ageing in China, Japan and Germany? After comparing the demographic situation in China, Japan, and Germany, empirical evidence on psychological well-being over the life course in these three countries will be discussed, concentrating on the individual factors that influence life satisfaction and happiness as people age. We will then move on to discuss the role of societal and economic factors for subjective well-being. Finally, we will focus on policies for active ageing and well-being in ageing societies. We hope that the comparative perspective of the workshop will be productive for learning from each other in terms of general challenges and opportunities that China, Japan, and Germany are facing due to demographic and social changes. Despite the many differences between the three countries in regards to economic development, social structure and political system notwithstanding, they share the challenge of rapid population ageing. The presentations are intended to stimulate discussion of research topics, methods and ideas that could suggest new avenues for studying the well-being of people in ageing societies from a cross-cultural perspective. Hence, the presentations should be brief and concise (10 minutes maximum) and focus on the three questions posed above. (a) life course trajectories of well-being; (b) individual, economic, and societal factors affecting well-being in late life; (c) institutions, cultural values, economic factors and social policies enhancing well-being. The workshop is expected to facilitate future collaborative studies among participants. By focusing on the discussion among experts from various disciplines we hope to encourage the cross-pollination among disciplines and leverage the creative potential of our cross-national and multi-disciplinary setting. Each speaker will give a concise input (max. 10 min) on research results which helps to discuss the following questions: -How does well-being change over the life course? -What are important psychological factors affecting well-being over the life course? Prof. Dr. Buxin Han, Institute of Psychology, Chinese Academy of Sciences, China Prof.
Each speaker will give a concise input (max. 10 min) on research results which helps to discuss the following questions: -What are the economic and business challenges of ageing societies? -How do these economic and business challenges affect well-being over the life course? Each speaker will give a concise input (max. 10 min) on research results which helps to discuss the following questions: -What kind of technologies can contribute to successful ageing and/or active ageing? -How do technologies affect well-being over the life course? Each speaker will give a concise input (max. 10 min) on research results which helps to discuss the following questions: -What are policies for successful ageing and/or active ageing? -How do these policies affect well-being over the life course? How did Japanese Social Policies Effect on Well-being for Older Persons?